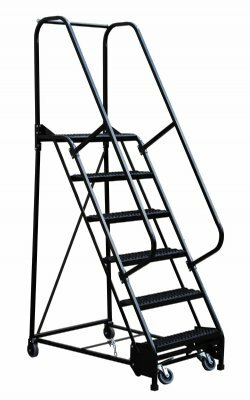 10 Step ESD-Safe Portable Warehouse Ladder, 100" Platform Height, 60° Angle, Conductive Semi-Gloss Black Powder Coated Steel. 10 Step Portable Warehouse Ladder for special ESD applications. Includes Grip strut steps, handrail, with welded square tubular steel construction. Rubber feet provided for floor protection. Unit has bottom step lock casters for safe use when climbing. This ladder comes standard with ESD (electro static discharge) features. Ladder must be used on conductive floors to comply with ESD properties. Ships fully assembled.